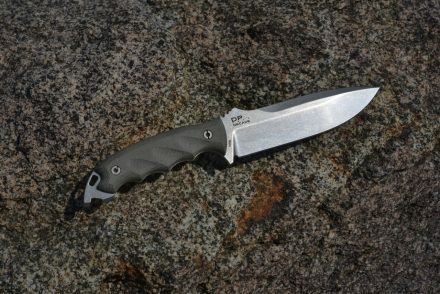 San Diego, CA – April 9, 2019 – DPx Gear, Inc. has released two limited run tenth anniversary knife models – the DPx HEST 6 Decade and the DPx Aculus Flipper. The fixed blade combative knife, the DPx HEST 6 Decade, is available in 100 numbered units and features hollow Micarta™ scales and Bohler M390 blade steel. 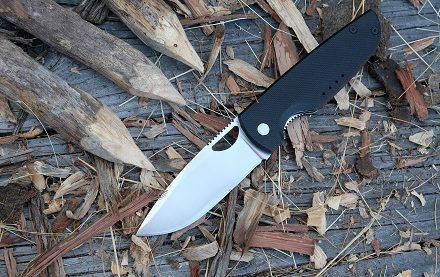 Also in M390 and featuring a new hollow grind blade, is DPx Gear’s first flipper release: the Aculus Flipper. Both knife models are available exclusively from DPx Gear and ready for immediate shipment. “When DPx Gear began we started with one idea and one knife. Make the best quality knife for the best customers,” says Robert Young Pelton, founder of DPx Gear on his first design, the HEST Original. It was a surprisingly simple but strong survival knife. The original HEST (Hostile Environment Survival Tool) featured paper Micarta handles, a multi-purpose design, large hollowed out and balanced handle, pry bar, wire breaker and managed to be both light and strong. It was an instant hit. A decade later DPx Gear has made and sold a lot of knives to a lot of great customers who appreciate our “field first” design philosophy. Designing a knife based on what is needed not what the latest marketing trend is. Using the right steel for each application, creating classic designs, testing, tweaking, testing some more and only after RYP has used, abused, passed around and beaten up his designs do we go into production. To make sure the execution matches the concept we only work with the world’s finest knife makers in America and Northern Italy. So what did we learn in ten years? Keep it strong, keep it simple, keep it light, elegant and balanced. And make it for a lifetime of use, building in the pursuit of patina and extreme hard use as a badge of honor not an exception. The HEST 6 design is a classic in that it combines military and outdoor survival requirements in a balanced, light ergonomic hard use knife. The first thing you notice is how light and balanced the blade is. The other takeaway is how perfectly your fingers flow into the carefully designed contoured grip in both normal and reverse grip. The pommel is unique in that it allows complete thumb coverage in combatives and the rounded spine that delivers comfort over hours of hard use. To celebrate a decade in business, we have selected a number of very limited run products. Combining our classic 6-inch design for SERE instructors and candidates with the classic Micarta handle and Cordura sheath. They are individually numbered and engraved with the special DPx Gear 10th anniversary “Decade” logo. An additional twenty unnumbered but specifically engraved versions have been manufactured to be donated, auctioned or used to equip U.S. Special Operations units and in support of Veteran causes. The DPx HEST 6 Decade comes in a black, MOLLE-compatible Cordura sheath with an extra storage compartment and can be purchased by visiting https://dpxgear.com/products/dpx-hest-6-decade. The new flipper version of the mono block frame gentleman’s knife, the DPx Aculus Flipper has innovative changes for 2019, including a flipper configuration in a solid one piece frame and a hollow ground Bohler M390 blade. The DPx Aculus is a hard use gentleman’s knife carved from a single block of Grade 5 aerospace spec 6Al4v titanium alloy. The Aculus is an every day carry tool with beautifully fluid lines, exquisite ergonomics, and a tough blade of the highest quality and finish. The frame is a single seamless machined piece of art, elegantly held together with only two screws. The Aculus was designed for undercover work, where professionals must dress in formal wear but must carry tools that cannot fail. The ergonomics had to work as a knife but also as a concealed hand held tool capable of dealing non-lethal pain to attackers. 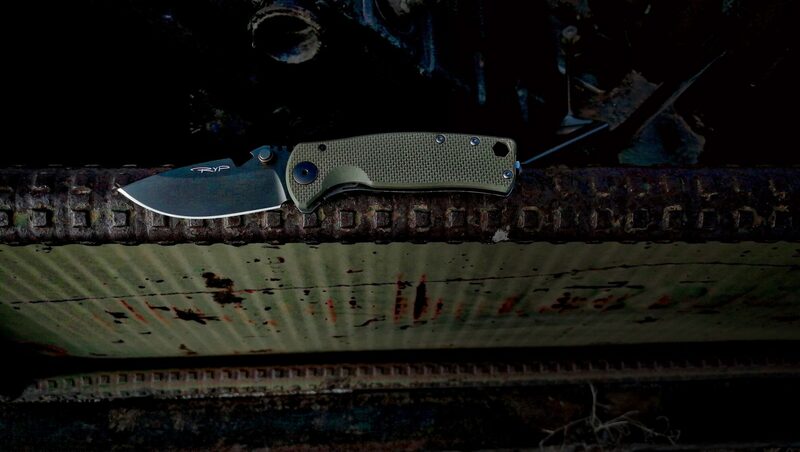 The DPx Aculus Flipper features a unique wave pattern for superior grip, a flat head screw, that can be changed out to a tungsten carbide glass breaker (sold separately), a deep carry pocket clip and razor sharp Bohler M390 blade steel. It can be purchased only by visiting https://dpxgear.com/products/dpx-aculus-flipper. Founded in 2008 by explorer, author and adventurer, Robert Young Pelton, DPx Gear, Inc. designs, tests and builds hard use equipment for special operations, expeditions and law enforcement. Learn more at www.dpxgear.com. 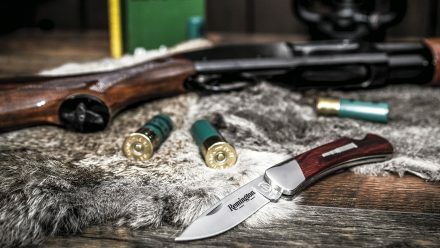 Post Falls, ID–3/5/2019 –Remington Cutlery introduced its second group of products under the official license of Buck Knives, Inc. at SHOT Show 2019 in Las Vegas, NV. The first Bullet knife was introduced in 1922. Many variations of this legendary knife have been created since that time. The Limited Edition MOA Bullet knife and the MOA Bullet knife are the 2019 editions, with limited quantities. The Limited Edition MOA Bullet knife features a drop point, 420HC stainless steel blade with an Ivory Paper Micarta® handle detailed with a custom sterling silver bullet medallion. The MOA Bullet knife also has a 420HC steel blade and is accented with a green DymaLux® wood handle and nickel silver bullet shield. Each Bullet knife in this series is proudly made in the USA. All Remington products are backed by a Lifetime Warranty. San Diego, CA – March, 1, 2019 – DPx Gear has released its new classic folder; the smaller, stronger, American made HEST/F Urban G10 in OD Green. The Urban reduces size and weight, compared to its larger, Italian-made bigger brother HEST/F 2.0, while increasing strength. That’s not something you hear much these days. Designed by Robert Young Pelton for DPx Gear and made by Southern Grind in Atlanta, GA, the DPx HEST/F Urban is the last pocket knife you’ll need for every day carry. Small, light and feature-packed, it’s just as at home in your jeans as it is in the tackle box. An heirloom quality piece of US craftsmanship that can be passed down generations with the support of a no-questions-asked lifetime warranty that DPx Gear customers deserve. Designer Robert Young Pelton is not just known for surviving wars, he is also an award winning designer, having earned recognition for his knife designs and has secured over a dozen patents licensed to DPx Gear. When Pelton was challenged with creating a smaller EDC version of the legendary hard use DPx HEST/F 2.0, the results were impressive. The HEST 2.0 features a thicker (.19″ vs the Urban’s .16″ thickness), longer (the 2.0 is 3.15” long vs the Urban’s 2.9”) blade but shares the same frame thickness with its smaller brother, the Urban. Weight has been reduced by an ounce and half (4.9 oz vs 3.55 oz) yet the usable blade edge is only about a quarter on an inch less. The Urban G10 materials make familiar and liberal use of DPx hallmarks like Grade 5 Ti-6Al-4V alpha-beta titanium alloy for the lock bar frame side. To lighten the G10 version we use the rough grip phenolic epoxy resin to make a lighter, smaller but actually tougher when thicknesses to length is tested. In keeping with only using American-made materials, the blade steel is CPM 154. Crucible Particle Metallurgy makes steels specifically for hard use knives. CPM 154 is a powdered steel compacted into shape, creating a perfect mixture made up of extremely fine particles. This gives the final DPx steel a flawless finish with better corrosion resistance and edge retention. 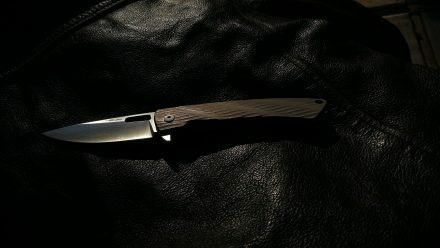 The finish of a DPx Gear knife is flawless. The Urban G10 in Olive Drab features a rough finish G10 frame side and a stone washed raw Ti side. The hardware is 440 Stainless and the high sabre grind blade is our new Ghost Grey matte finish PVD. 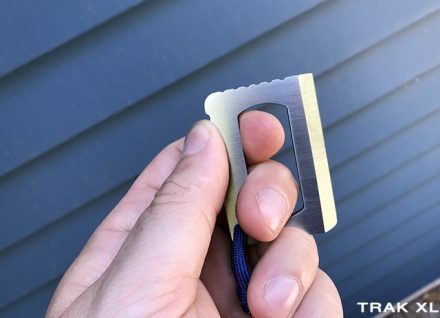 The LEDGE is an EDC pocket knife desgined by Brooklyn-based StatGear, and is currently up for funding on Kickstarter. Designed as a modern take on the classic, non-locking slip-joint folding knife, the LEDGE features a D2 steel blade with a modified sheepsfoot profile, and an extended nail nick that runs along the spine of the blade for easier opening. The handle is made of textured G10 scales for a positive grip, with a dual-layer inlay that gives the knife a distinct look. The LEDGE is finished with a reversible pocketclip, which allow for a deep, tip up carry on the user’s preferred side. While a non-locking mechanism may seem a bit outdated, one of the main benefits of StatGear having designed the LEDGE with a slip-joint action is that it is legal in countries like Canada and the UK that have more stringent laws regarding carry knives. Post Falls, ID — Friday, January 4, 2019– Buck Knives, leader in sports cutlery, is excited to partner with Taylor Guitars, one of the world’s leading manufacturers of premium acoustic guitars, and take part in their efforts using a sustainable supply model for genuine Ebony handles on its key heritage products. Ebony wood was originally introduced on the 110 and 112 models in the 1960’s, but in the 1990’s, federal regulations on endangered woods led Buck to utilize resin treated woods. Harvested under Taylor’s thriving conservation project, Buck will again employ the use of ebony, a natural material with beautiful grain patterns that provides customers with a nearly indestructible knife handle. White River Knife & Tool on Discovery Channel! White River Knife & Tool, Fremont, MI, January 3, 2019 – White River Knife & Tool to be featured on How It’s Made, seen on the Discovery Science Channel. White River Knives will be featured on How It’s Made at 10:00 p.m. Eastern Standard Time on Thursday, January 10, 2019. If you miss it, this episode (among others) will be played randomly throughout the following weeks and, if you are attending the 2019 SHOT Show, it might make a good match for you to visit the White River booth (1114 lower level). How It’s Made follows a chosen company’s specific product from start to finish.The White River episode will be filmed at its production facility and follow the creation of its high-quality cork-handled fillet knife. How It’s Made is a very popular worldwide show that began in 2001 and is not a pay-to-play show. They make the contacts and send in their production team only after they hear of unique and/or high-quality products that their producers deem worth showing to the public around the world. How It’s Made is a high-quality show and this episode shows the production of a truly high-quality knife from an exceptional all-American Made company. If you are at the SHOT Show, please visit with the Cammenga family of knife makers at their SHOT Show booth 1114 (lower level), you will find your visit more than “just” interesting. White River Knife and Tool, Inc.
Posted in Knives, Press Release | Comments Off on White River Knife & Tool on Discovery Channel! Post Falls, ID — Wednesday, December 19, 2018– Buck Knives, leader in sports cutlery, is pleased to announce the introduction of Cerakote to its manufacturing and production capabilities. Housed in Buck’s 132,000 square foot manufacturing facility in Post Falls, Idaho, the new Cerakote lab contains curing ovens, a robotic spraying arm, and a variety of color options for Buck’s growing product line. Cerakote is a Polymer-Ceramic Composite coating that provides superior protection against abrasion and scratches while enhancing physical performance properties including wear resistance, corrosion resistance, chemical resistance, and strength. 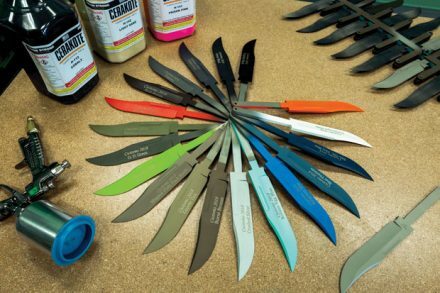 After receiving comprehensive and hands-on training, Buck Knives’ factory trained technicians mix the coating to exact specifications and utilize computer programs to create custom handles and unique blades. Recognizing the need for corrosion and abrasion resistant coating and the value add benefit to its products, Buck Knives will soon offer several customization options with a shortened lead time. 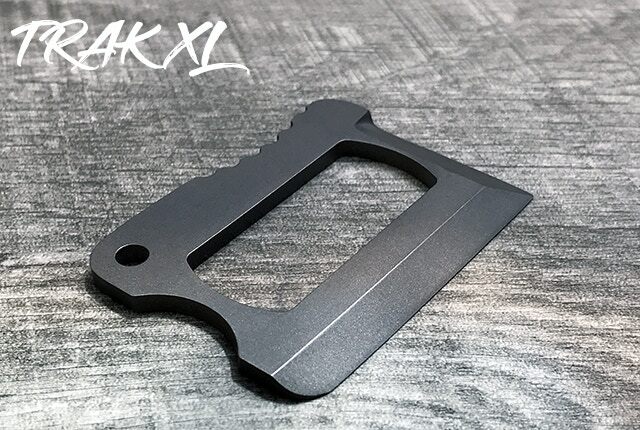 Many new products for 2019 will feature Cerakote coated blades and hardware. Buck’s customizable 722 SpitFire features several different Cerakote color options for customers to create a truly unique and personalized everyday carry knife. ‘The Princess Bride’ is a classic and memorable film, with the above quote, and the character attached to it, Inigo Montoya, being one of its most oft-mentioned references. 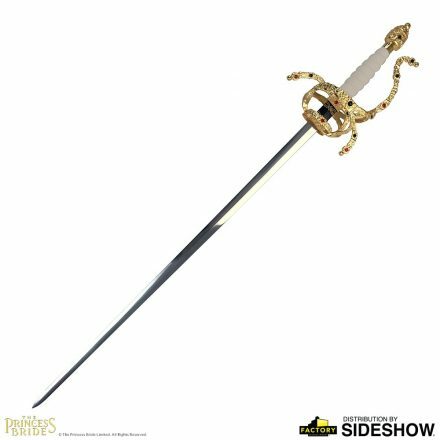 Factory Entertainment and Sideshow Collectables have partnered up to release an officially licensed replica of Inigo’s sword from the film. Copied from the original prop sword, this replica features an SAE1060, hand-forged blade, and an ivory leather-wrapped handle. The sword is further decorated with an intricate gold-plated brass basket, inlaid with reproduction gemstones. Like many Sideshow releases, this one’s a pre-order, with an expected release date of October 2019. The Sicario is a limited edition collaboration between RE Factor Tactical and Toor Knives. They based the Sicario on a Persian Fighting Blade which offers the user both slashing and stabbing capabilities. The 4″ blade is long enough to offer the user the ability to reach vital organs while still having a small enough blade to conceal if needed. The knife is hardened to a Rockwell hardness of 60 and is coated in H-series graphite black Cerakote. The handle is black textured dymalux giving the user ideal grip regardless of the circumstances. All knives come with a durable kydex sheath with a 5 lbs draw retention. Each knife also features an individual serial number that will be given to customers based on the order in which the knife is purchased. All Toor knives are hand made in their facility in California. Post Falls, ID — Thursday, October 4, 2018– Buck Knives has added the popular 722 SpitFire model to its Custom Knife Shop. The 722 SpitFire is a lightweight everyday carry knife originally released in 2013. 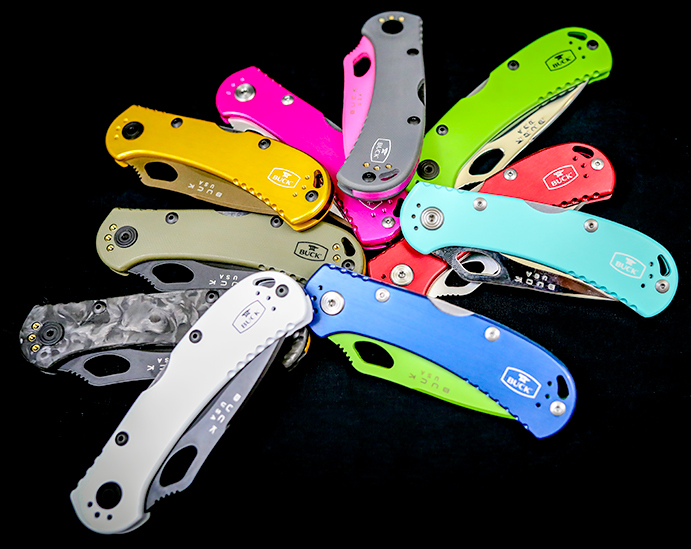 Customizable options include a variety of different handle colors and materials, including Aluminum, G10, and Carbon Fiber. Different blade steels and finishes are offered in satin finish, mirror polish, and Cerakote® coated colors. The SpitFire was added to the Custom Knife Shop as an everyday option to offer customers a vast array of selections when designing their knife, including the option to engrave on the blade and handle. Customers can mix and match hardware, spacers, and clips to create their own completely unique version. 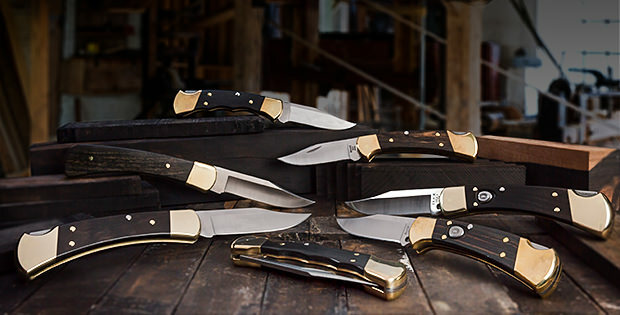 Buck’s Custom Knife Shop offers exotic handle materials, different blade steels and additional accessories and display boxes on favorite Buck models. Post Falls, ID — Thursday, September 27, 2018– Buck Knives has introduced a variety of new knives to their lineup this year, including additions to the 112 Ranger line. The 112 Ranger is now available in a lightweight version. The 112 Ranger LT weighs in at only 2.5 ounces compared to the 5.6 ounces of the original 112 Ranger. Utilizing the same famous 420HC steel clip blade, the bolster and handles were replaced with a lightweight molded nylon to reduce weight while maintaining the same quality and rigidity. MSRP: $34. Made in the USA. 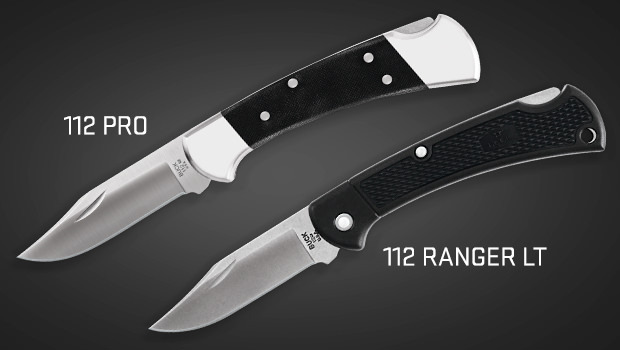 Another addition to the 112 family is the 112 Ranger Pro, available with an upgraded satin finish S30V clip blade and rugged black G10 handle with brushed nickel silver bolsters. This pro version of the 112 with premium materials will easily become a favorite for those who love the 112 and require ultimate performance. Includes a genuine leather sheath. MSRP: $112. Made in the USA. The additions to the 112 Ranger line all feature blades finished with Buck’s advanced Edge2x™ technology that makes them sharper out of the box, hold an edge longer, and easier to re-sharpen. All are made in the USA and backed by Buck’s respected Forever Warranty. Post Falls, ID — Wednesday, September 19, 2018– The classic 112 Ranger has been transformed into an exciting automatic knife. The 112 Auto and 112 Auto Elite are powerfully deployed with the push of a button, instantly readying the blade. The two 112’s recently debuted at the Outdoor Retailer Show are now available. These versions include a modern twist to the classic utilizing the same Macassar Ebony handles and 420HC steel blade, as well as a black G10 handled version with upgraded S30V steel. The OMNI is a miniature EDC knife created by UK-based HRIBARCAIN, and currently up for funding on Kickstarter. The OMNI features a blade just over an inch in length, with an overall length of 3.75 inches extended, and roughly 2.5″ folded. The body is reported to be made of 7000 series aluminum, and the OMNI features a unique sprung pivot design, which locks the blade into place. The blade itself is made of Damascus-patterned steel, and is designed for heavy-duty use. The TRAK XL is an EDC utility knife currently up for funding on Kickstarter. A larger version of the successfully-funded TRAK knife, the TRAK XL features a unique ‘Secure Grip Retention System’, which consists of a two-finger retention opening with a ring finger hold on the bottom, and anti-slip thumb jimping along the spine and top of the knife. The TRAK XL is being offered in two blade materials: titanium and S35VN stainless, in multiple finishes, including anodized colors for titanium, and cerakote for both. 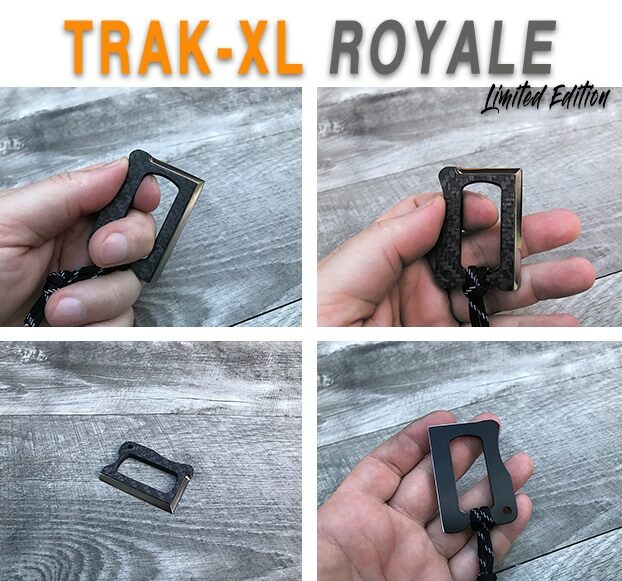 There’s also a Kickstarter-exclusive TRAK XL Royale, with a titanium base layer with a carbon fiber shell. This version will be limited to 50 knives. Made from 24 individual parts, the Eclipse features a Wharncliffe-style blade made from 440 stainless steel, with a handle made from G10 FR-4 fiberglass epoxy. Offered in two colors, the “Silver” option has a bead blasted 440C frame, links, and blade. The “Black” option features a 440C black oxide handle and links and a 440C black coated blade, both with black G10 scales. YouTube channel Miller Knives has released this video detailing a (fast forward) process for forging a karambit knife from an old drill bit. A bit of a warning: there’s a very sudden ad from about one minute in to about 1 minute, 45 seconds. You can check out more of Miller Knives’ creations via their YouTube channel here. Winchester, Ky. (May 2018) – DoubleStar Corp, manufacturers of high-quality, US-made AR components, rifles and pistols, will unveil the Path Seeker, its latest knife from its Edged Weapon Division, at BLADE Show 2018, to be held in the Cobb Galleria Centre in Atlanta, Georgia, June 1 – 3, 2018. The Path Seeker was made in collaboration with published author, television star and Iraqi War veteran, Hakim Isler, and will be shown to the public for the first time at the BLADE Show. It is DoubleStar’s first installment in the world of Bushcraft knives. Forward leading profile ideal for chopping. Designed thick to provide durability and for wedging. Comes with baton area on spine at head of blade. Designed with ferrocerium rod scraper on back to preserve edge retention. Equipped with lanyard holes for fastening. “The construction of this knife screams indestructible and innovative. Our goal with this knife is to reach out to the experienced trailblazer with features that even the novice can depend on. Hakim’s experience in this field is rock steady, forever honing his craft, and that’s why we knew we had to team up with him to create this knife,” commented Rob Cabrera, Edged Weapon Division Director. For more information about DoubleStar, visit www.star15.com. At 8″ in length and with a 3″ blade, BucknBear’s Mini Survial Hatchet certainty embodies its name, but is still designed to be a solid and functional piece of hardware. 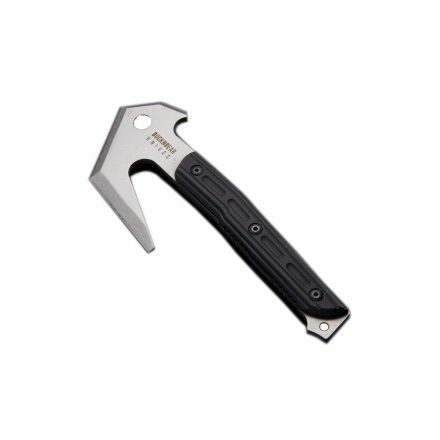 Made of 440C stainless steel, the Mini Survial Hatchet features full-tang construction, and a non-slip, G10 handle. The Mini Survival Hatchet also comes with a kydex sheath. Plus, for a bit extra, purchasers can have the hatchet engraved with up to 13 characters. 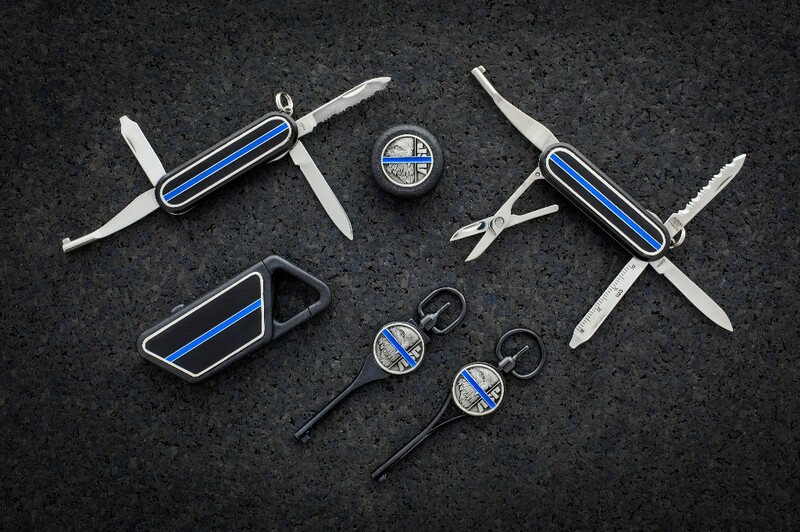 Appleton, WI, April 30, 2018— Armament Systems and Procedures (ASP) has introduced a collection of products featuring the well-known “thin blue line” design, universally recognized as a tribute to the contributions and sacrifices of law enforcement. 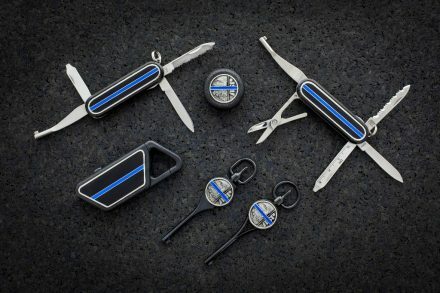 The company’s new Blue Line Collection includes a Sapphire rechargeable clip-on flashlight (MSRP $24), a pair of multi-tool, liner lock pocket knives with integral handcuff keys ($32-$45), tactical belts ($20-$21), a logo cap that fits ASP Friction-Loc Batons ($17), and two different swivel handcuff keys ($22). Each is decorated using cloisonné enameling—a deep, permanent, heirloom-quality process that results in a finish that won’t fade or wear off, unlike painted or screen-printed surfaces. The flashlight and knives also have brightly-polished metal accents. For more information, or to find a distributor or dealer, visit asp-usa.com. In a roundabout way, this shows that just about anything can be turned into a weapon. Proving this point even further, the same video creator turned a hunk of dried fish into a knife. You can check out Kiwami Japan’s other videos via their YouTube channel here. Built for the unforgiving environments encountered by military, law enforcement and emergency response professionals, Outland’s American-made Multi-Mission Series axes are reliable tools for rescue and survival situations. Mont Vernon, N.H. (April 2018) – Although axes have been used throughout history as a tool and weapon, little has changed over the millennia in its design. For today’s first responders, military and law enforcement professionals, the axe is still a primary tool for rescue, breaching and survival scenarios. Outland Equipment designs and manufactures state-of-the-art axes and knives specifically engineered to meet the critical demands of those that go in harms’ way. Outland has produced three Multi-Mission Axes (MMA) that not only perform the requirements of an axe, but also integrate other functionality including hammering, prying, cutting seatbelts, cutting sheet metal and working with hex fasteners. The MMA 1502, 1902 and 1503 are all made from a single piece of hardened S7 tool steel, a steel formulated to withstand extreme shock and impact. The head of the MMA series features a 3.9 inch cutting edge with a bolt-on hammer and hex nut tool. The MMA 1502 and 1503 are 15 inches in length, a size convenient for carry and maneuvering in tight spaces. The MMA 1902 with its 19 inch length provides enhanced reach, impact force and leverage. The tail of the MMA 1502 and 1902 feature an angled pry bar, seatbelt cutter and sheet metal cutter. The MMA 1503 tail features an angled pry bar, seatbelt cutter and a hex wrench for urban and residential environments. The handle grips are made of G10 material, a fiberglass-based epoxy resin that is not only extremely rugged but also impervious to moisture and chemicals, important factors for rescue operators. The handle has been shaped to offer the operator multiple hand positions to optimize a positive grip for the job. All of Outland’s MMA axes are covered with a Modular Sheath that allows for easy access, quick deployment and multiple carry options. The axe is secured in the sheath using an internal latch and two BioThane® Coated Webbing straps. Carry options are endless for the operator, as the Modular Sheath accepts accessories for mounting on a belt or MOLLE gear, can be bolted to a vehicle or worn on a shoulder strap. Holmedal, Norway – (April 10, 2018) – Building on an 85-year tradition handcrafting knives designed and tested in the outdoors, Helle unveils its latest collaboration with Les Stroud, star of Survivorman. Named for the vast wilderness park in Ontario, Canada, the Wabakimi knife is designed for self-reliance in nature. The third in a series of Helle knives designed with Les Stroud, the Wabakimi combines Helle’s 85 years crafting traditional Scandinavian knives with Stroud’s mastery of primitive skills. The latest addition is a medium sized, well-balanced knife small enough for hip carry, yet amply sized to make precise cutting and long carving sessions comfortable and efficient. The new knife fits between the larger, best selling Temagami (2010), a practical wilderness knife, and the light and compact Mândra (2017) neck knife. The Wabakimi combines the advantages of the Temagami’s ergonomic handle and long, pointed blade with the Mândra’s rounded shape. Featuring a three-quarter, partial tang reinforced with two robust pins, the handle is made from curly birch wood with a lanyard hole and a 3.3-inch drop point blade using Helle’s renowned triple laminated steel. The new design was conceptualized over several months and handmade prototypes from the Helle factory in Norway were sent to Stroud for extensive field-testing in Alaska. Each prototype received further adjustments and refinements based on invaluable feedback from Stroud. This approach of researching, prototyping, field-testing and refinement constitutes the heart and soul of the Helle design philosophy. Since 1932, Helle has earned a solid reputation for quality, craftsmanship and producing aesthetically stunning and highly functional knives made to withstand a lifetime of rugged outdoor use. All Helle knives are handcrafted in Norway to exacting standards based on over 85-years of tradition blending form and function. It takes up to 45-manual processes to complete each Helle knife, from sanding and polishing of the handles to forming the Scandinavian ground blades. The result is an authentic, truly one of a kind knife made to last a lifetime of rugged outdoor use. For more information visit www.helle.no. Survival expert, filmmaker, writer, singer-songwriter, speaker and performer best known as the Canadian Screen Award winning producer, creator and star of the hit TV series Survivorman. Les Stroud is the only producer in the history of television to produce an internationally broadcast series entirely written, videotaped and hosted alone. He has been nominated for 26 Canadian Screen Awards and has won for Best Writer (twice) and Best Photography. A celebrated keynote speaker, musician and Globe and Mail best selling author of “Survive! Essential Skills and Tactics to Get You Out of Anywhere – Alive!” and “Will to Live”. A proud member of the prestigious Explorers Club, Les received Fellow (highest rank) of the Royal Canadian Geographic Society. He contributes to dozens of charities and benefits and is an advanced survival trainer for the Canadian Military Armed Forces. For more information visit http://lesstroud.ca/. I just had to post this. 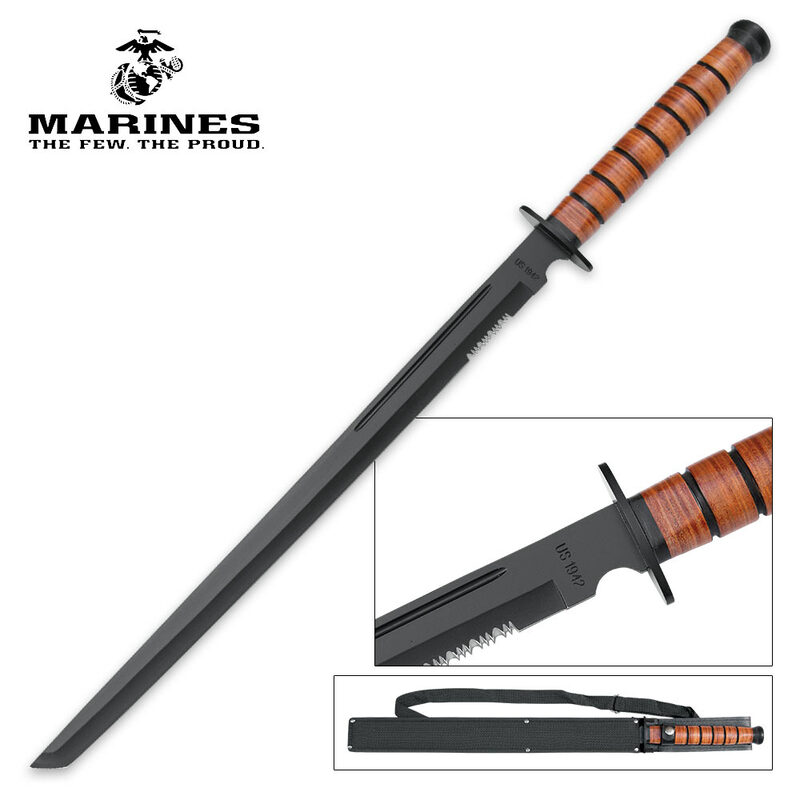 It’s basically an unholy amalgam of a katana and a USMC Mark 2 combat knife made of AUS-6 stainless steel with a non-descript black coating. It has a half-tang, with a stacked leather handle. It comes with a nylon sheath with a shoulder strap. There’s definitely a fantasy knives and swords shop in a near-dead mall somewhere that has, like, 5 of these up on the wall. The Chase is a folding knife currently up for funding on Kickstarter. Inspired by the utility of the classic fixed blade knife, the Chase features a grip with scales made of either G10 or hand-poured resin in a ‘Sea Grey’ color, and a blade made of N690co Stainless Steel. The drop point-style blade comes in at just under 3″ in length, and features a flat grind, and a thickness of .104″. Check out the campaign at the link below for more info, and to fund the project. PORTLAND, OREGON (January, 23rd, 2018) – GERBER, an industry-leading manufacturer of knives, multi-tools, and gear, announced today that it will debut the Empower™ series at Shot Show 2018 in Las Vegas, Nevada. The first look at the series comes ahead of the May 1st launch date, when the American-made automatic knife will be available to purchase for $125 at retail. The new series is available in 4 distinct styles, each with varying color and material combinations that aim to appeal aesthetically to the EDC consumer. Based on the chassis of the field-proven Propel, the Empower is Gerber’s newest American-made automatic knife. Specifically designed with a focus on everyday carry, this daily workhorse wields lightning-quick deployment and safety-focused locking mechanisms. A false edge spear point blade (available in a stonewash or black oxide finish) delivers utility and piercing capability, ideal for survival situations and daily chores alike. The oversized plunge lock and safety slide partner together to provide unrivaled control when deployed, as well as keep it safely stowed when in pocket. The Armored Grip™ handle scales offer reliable control and a tactile hand feel; photo-chemical etching provides a quick, confident grip as well as different design options to choose from. The Empower joins an honored lineage of iconic products that are manufactured in the Portland, Oregon facility – learn more about Gerber’s commitment to American manufacturing here. As always, Gerber remains dedicated to crafting tools that stand the test of time, and each product is backed by Gerber’s limited lifetime warranty.